John Streeter (’90) graduated from the UH Radio and Television program at the Jack J. Valenti School of Communication with a knack for making interesting films of all kinds. 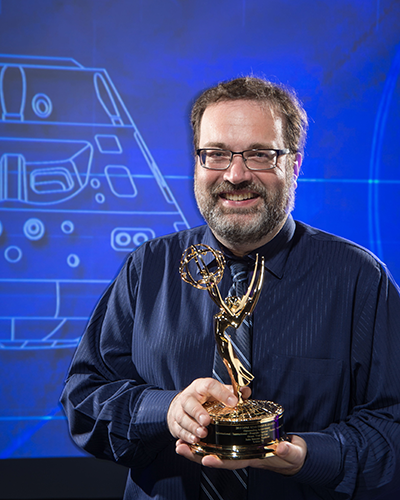 Employed by the Johnson Space Center, he is the recent recipient of a Lone Star Emmy for his film “Orion: Trial by Fire.” Streeter catches up with the Lunar Cougar to share some of his best UH memories, especially those involving professors who influenced him during his time at the University. LUNAR COUGAR: What do you enjoy about working at Johnson Space Center? Working at the Johnson Space Center is always exciting. When working in video production: producing, scriptwriting and editing, it is really great to have such interesting subject matter. Whether it’s a new spaceship that NASA is building, interviewing astronauts about their latest space mission, or seeing a new piece of space hardware that will be sent to the International Space Station, I always find an amazing variety of fascinating topics here! NASA is dreams in action, and I am always so proud of our space program when I see something transform from an idea to reality, actually flying in space. What is your favorite part of the process: screenwriting, producing or directing? The whole process of making this video was fun. For the screenwriting, I met with the Orion engineers and asked lots of questions. I had to understand the space mission in detail so I could pick and choose the main points to help the audience understand what it was all about. This is also part of the producing process. I picked one of the engineers to be the host/narrator of the video. This added a more personal touch to the Orion story. These studio shoots were a lot of fun to direct, and I used my art skills here too, drawing diagrams, math formulas and spacecraft on sheets of glass as part of the set. In the end, one of the parents of the Orion engineers approached me and said, “I finally understand what my son is working on.” That was very gratifying. Other UH alumni worked on the film, as well? At the NASA Johnson Space Center, I happen to work with alongside two outstanding UH alumni. I felt very fortunate to collaborate with such talented people who not only are coworkers and fellow alumni, but also friends. How has your education at UH shaped your life? At NASA, they required a degree in this field, so I was glad I had one. UH classes really did put together a lot of theory and hands-on work, so you got a chance to practice your craft on a lot of different projects. How difficult, how ambitious and how artistic those projects were was really up to the student. I think the professors I had did encourage us to try and achieve our vision, no matter how difficult our ideas sounded. It helped us to figure out creative ways to make our projects better. I can’t pick just one professor, as there were many who influenced me at UH.I have to give a lot of props to Dr. Robert Musburger (Dr. Bob) who taught us both studio and field production. He put us through some high pressure situations that really revealed what real video production is like. I feel he was right on target, as this prepared us for the real world. Thanks Dr. Bob! Another professor I really remember was Dr. Mintz. He was not a video production teacher, but he taught a “History through Film” class that was fascinating! I saw a lot of movies I would have otherwise never seen and I was exposed to how filmmakers can make poignant comments about society through film. It was an artistic eye-opener and I really enjoyed his lectures and film selections. Dr. Raymond Fielding was another of my favorites, as he brought a touch of Hollywood to UH. He taught some basics about filmmaking and taught a wonderful class on animation. Having an artistic side, I was introduced to many different animators and their amazing work. Finally, Mr. Craig Ness was a fantastic film teacher. He taught us the impossible task of making 16mm movies. This was the real deal, physically slicing film and splicing it together. It was very difficult, but I am so glad I had those experiences. When I am not making videos as a producer, scriptwriter and editor, I like to draw. It is a talent that has helped me in my career, making storyboards and concept art. I find it very relaxing and wish I could do it more. One of my favorite activities is to take a sketch pad to the Museum of Fine Arts, pick something out and sit down and draw it. My dad taught me to draw when I was very young and it reminds me of him. Houston has a lot of pluses in that it is ethnically diverse, it has an appreciation for the arts and it has a lot of opportunities. It also has UH! I believe you should study what you have a passion for. I know that Television Production is a very difficult field to get into. If you want to do this line of work, I would suggest you make as many projects as you can now, for experience. Use the knowledge your classes give you and get busy making videos! You will learn a lot more by doing and it is best to make your mistakes now. Also, I would recommend studying something else as a minor to strengthen your resume. I wish all the liberal arts majors out there the best of luck. I have met some great students out there with a lot of passion and willingness to learn. I think that type of student can make it, even in a field as tough as video production.